I love the craftbeer movement. I love that I get to call it the craftbeer movement, which makes it sound a little like a band of rebels intent on overthrowing the occupying armies of a despotic regime. Think; the French resistance during WW2 , or (geek alert) the Rebel Alliance in StarWars. One of the things that I most love about the craftbeer movement, is that I get to meet interesting and passionate people, who do what they do because they love what they do. 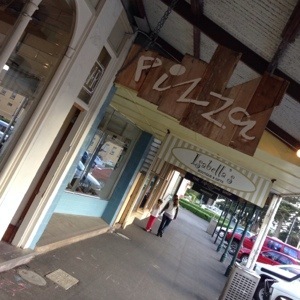 Yesterday I met Nick and Marcus, who together run Coffin Sally, a funky little pizza joint in Port Fairy. The pizzas look, smell, and taste fantastic! Actually, I can only give a second hand report about the taste of the pizzas, but the vonSchlapper children absolutely inhaled their margarita (tomato, mozzarella and basil). 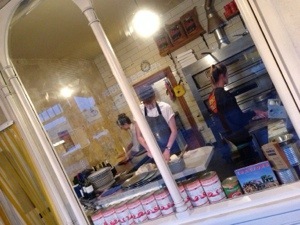 The kitchen is in the shop window, with a small counter for serving takeaway customers. It’s thoroughly enticing to wander along the high street during the afternoon, and see the team prepping dough and toppings for that night’s service. Head past the kitchen, down the narrow corridor, and find the bar. There’s an open fire, a couple of tables, a walled courtyard, and if you go further still, an eclectic dining-room full of mismatched tables, chairs and light-fittings, with laid-back tunes loud enough to listen to but quiet enough to talk over. There’s a small but well thought out beer list, with; Stone & Wood Lager, Pale Ales from Bridge Road and Kooinda, and Holgate’s marvellous Temptress, plus others. Now I struggle to go past Temptress when it’s available, especially on a wet and windy night. 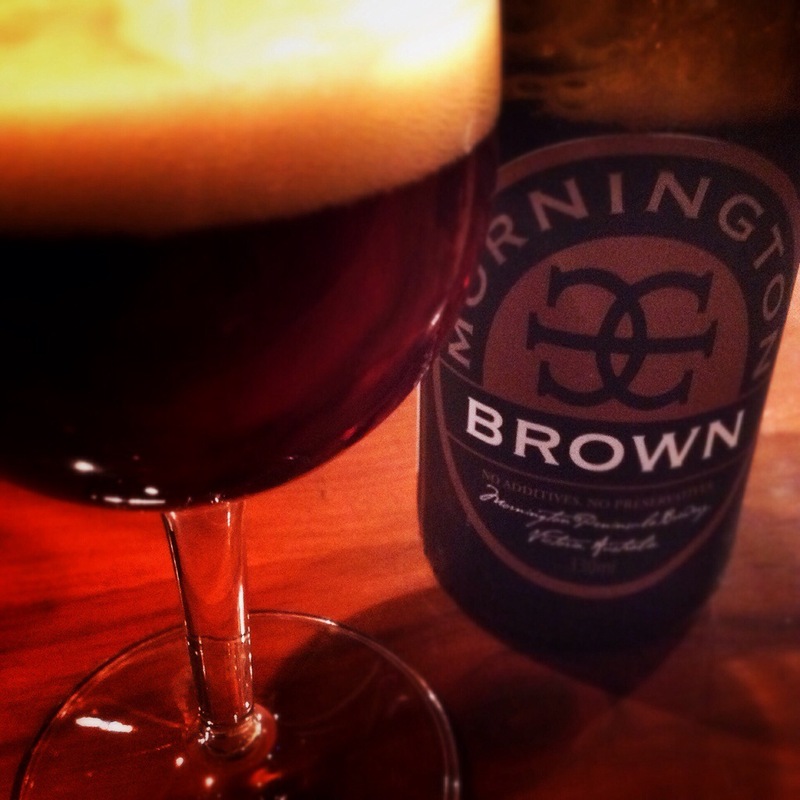 It’s a great beer, which serves up chocolate and vanilla and caramel, but balances all of that sweetness with a perfect hit of coffee-shaped bitterness. I didn’t have to ask for a glass, which is a good sign. And the glass wasn’t chilled, which is a better sign still. They were latte glasses, which I thought an odd choice, but actually added to the casual charm the place (glasses of rosé and riesling were served the same way). The service was great too; but then I love that natural banter that you can have with guys who are enthusiastic about their new project. Nick and Marcus and I talked about craftbeer, and homebrew, and transition beers, and about some of their plans for the future. 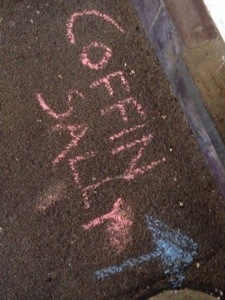 It’s fair to say that Coffin Sally has won a fan this weekend: I can’t wait to come back, and see how those plans are going. Malted barley. Hops. Yeast. Water. Yet, the most amazing breadth of flavours can be created by the master-brewer. 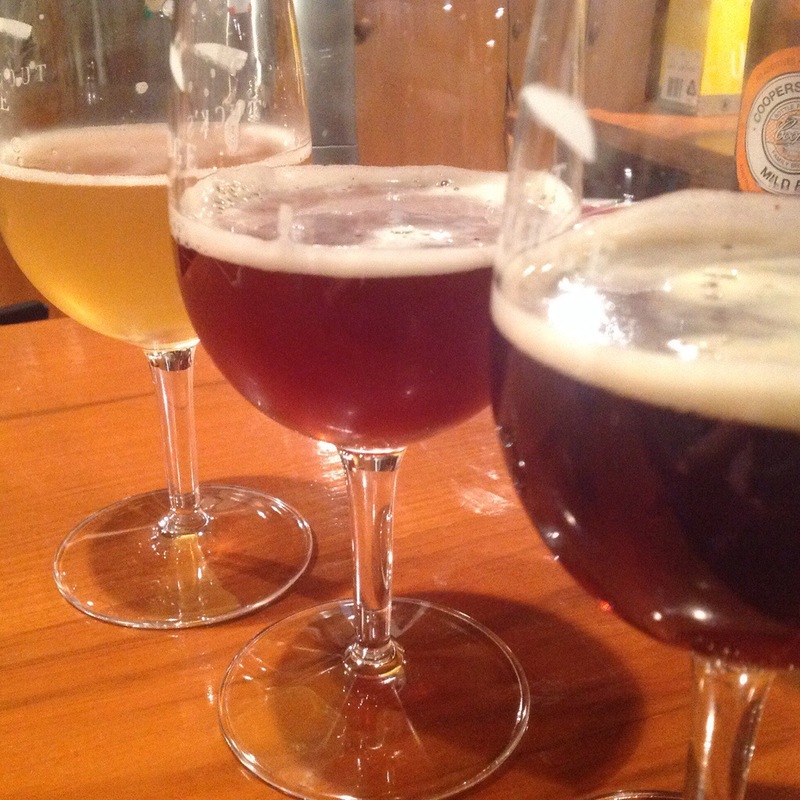 Beer is such a diverse drink; a yeasty Saison bears little resemblance to a roasty Stout. And even within a style, one example can be poles apart from another. One of the great things about craft beer, is that this diversity is celebrated. It’s perfectly ok for a beer to divide opinion. 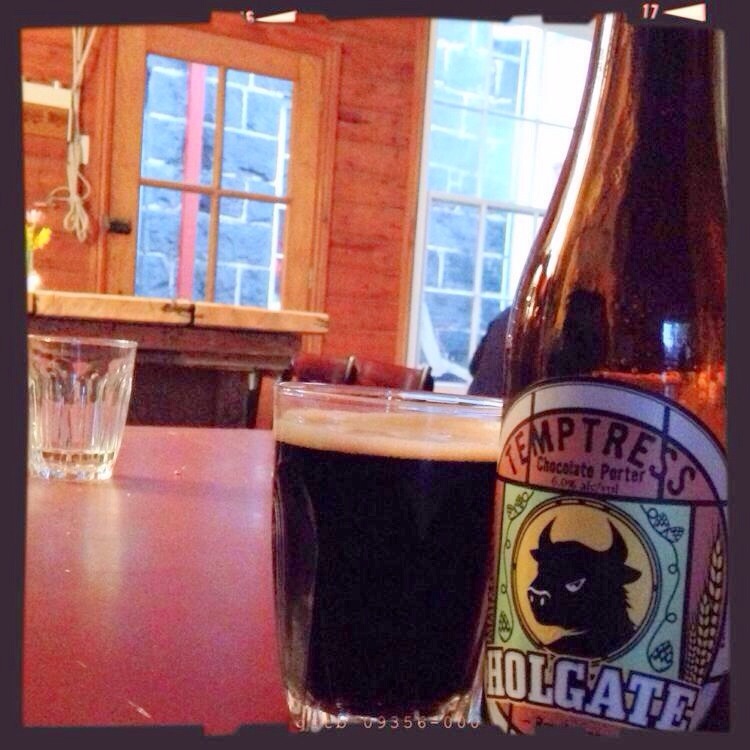 And, a beer that divides opinions more than most, is RexAttitude from New Zealand’s Yeastie Boys. Rex is a beer brewed with peated malt. XeRReX is the one-off single-batch Imperial version. 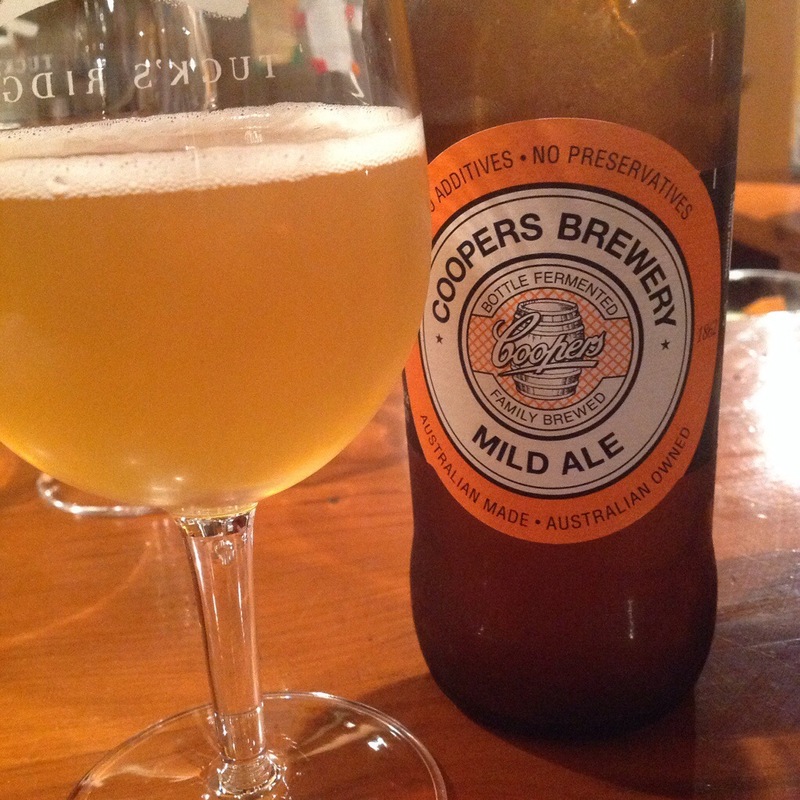 Actually, I think it’s really important that brewers brew beers which split the craftbeer world in two. I’d rather open a beer that I really dislike, than one of which I have no opinion. I’m not sure that this is a mindset shared by some other craftbeer drinkers. XerreX currently rates at 3.58 on @untappd. This means that either the majority of drinkers/raters think it’s unremarkable (seriously unlikely) OR the lovers balance the haters (much more likely). WARNING: SCHOOLBOY STATISTICS ALERT! Using the mean is less useful than the mode. Mean is when the sum of the responses is divided by the number of respondants, while Mode is simply the most commonly selected response. 3.606 tells us nothing, but knowing that most people rate it 5, slightly fewer rate it 1 (nobody rates it 3) tells us much more. I’ll fess up. I really disliked it, right from the moment of the click-pfft, even before I’d poured it; the smell of smoke was overpowering. And lifting the glass to my mouth brought me closer to the smell. And in the mouth, all I got was smoke. People talk about its balance malt profile. I couldn’t taste anything but smoke. The odd thing about Yeastie Boys XerreX is that despite finding it revolting, I love it! Don’t get me wrong, I never ever want to drink it again, but I love that it exists. I love that some mad kiwis have been told “You can’t do that: It’ll never work!” But they did it anyway. Think of all the people throughout the course of history to whom that was said; Leonardo DaVinci, Gallileo, The Wright Brothers, Christopher Columbus, James Cook, Edmund Hillary. I love that while I hate XerreX, I love Yeastie Boys Gunnamatta. I love that the same creative spirit that embraces peat-smoke also embraces tea leaves. I love that there are brewers out there pushing the boundaries of what can be done with 4 simple ingredients. I love that in the craftbeer world there is a place for beers like XerreX. So, how do I rate it on @untappd? 5 because I love that it exists? Or 1 because its horrible*? Definitely not 3, because it is anything but mediocre!